Plasticity Labs was named Innovator of the Year by Canadian Business magazine. Jim Moss (BA ’12) founded Plasticity Labs two years ago with his wife Jennifer, chief marketing officer, and Lance Mohring, chief technical officer. The concept for the company blossomed out of a digital gratitude journal called The Smile Epidemic, which Moss began while recovering from a rare autoimmune disease. Moss realized the happier and more optimistic his outlook, the more success he had with his rehabilitation. By sharing moments of gratitude on the blog, he also received feedback from others sharing their stories of happiness and gratitude. Interested in the influence of happiness, Moss enrolled in Laurier’s Psychology program. Collaborating with Laurier Psychology Professor Anne Wilson, who has been involved in Plasticity Labs from inception, Moss researched how happiness, well-being and gratitude directly related to enhancing workplace happiness. 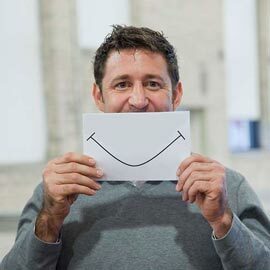 As the success of The Smile Epidemic grew, Moss looked for opportunities to turn his passion for happiness into a viable company. As a Laurier student, Moss enrolled in the Laurier Launchpad, an incubator for start-up ideas. There, he took classes and received some much-needed mentorship. “We were struggling to find the business model,” said Moss. “The Laurier Launchpad put us into the Accelerator Centre, which really got us lot of mentorship about being a business. Six months later Plasticity Labs was launched. Plasticity Labs uses an app to measure and boost workplace happiness by monitoring employee moods each day. The digital platform asks workers to rank their attitude from one to 100 over a period of time in order for companies to track and understand how work and personal environments impact their employees’ moods. What’s key to the company’s success is that it uses an evidence-based approach to inform its services. Through research – Plasticity Labs employs four PhD graduates from Laurier’s Psychology department – the company can prove how employee happiness impacts the bottom line. By increasing workplace happiness, workplaces can generate higher energy levels, less sick days, more capacity to deal with stress and more overall workplace productivity. Happier workplaces also result in an increase in job applications – since people want to work in a happy environment – which exposes employers to more competitive and qualified applicants. Moss says he never expected to grow his dream so quickly and is surprised that its innovativeness would be recognized so clearly by others. So far, more than 40 Canadian companies and organizations have signed on with Plasticity, including TD Bank, Questrade, the Public Health Agency of Canada and a major domestic clothing retailer. Moss will be establishing Plasticity’s sales and marketing team in New York in 2016 to help the company grow globally, but will keep engineering and product development in the Waterloo Region. So what’s the secret to Moss’s success?